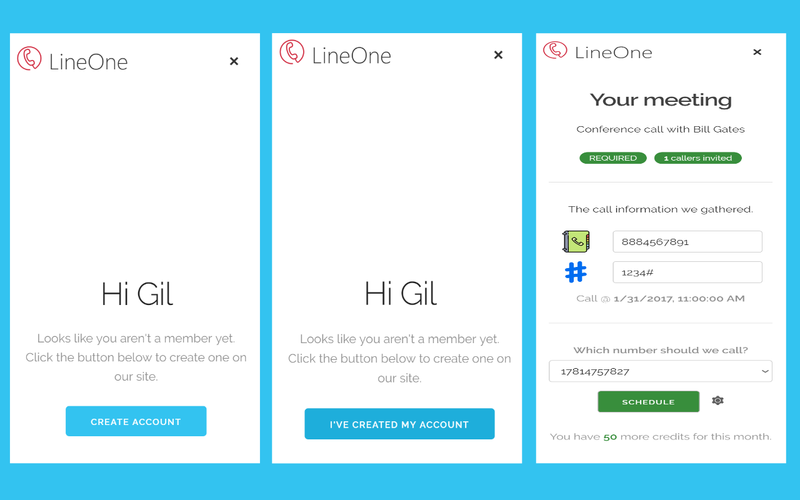 My name is Gil Ferreira and I'm the creator of LineOne . In this post I want to give you an introduction to what the service is and how to use it! LineOne solves an issue that we've all accepted as "that is just how it is". That problem is conference calls. Dialing into a conference can be a drag. I consistently forget the pin or mis-dial it. After a few tries I'm hung up on and back to square one. Which turns into frustration. I end up looking like this. Those days are gone now! If you use the LineOne add-in for Outlook we can intelligently gather the call information and call you right before your call. No dialing, mis-dialing or frustration. Just click the Call Me button in your appointment and we will take care of the rest. This is a service that I always wished existed. It is a simple way to make life a little easier. Why not streamline something that everyone hates doing? The biggest issue I ran into was browser support. I initially had an issue with the code becoming overwhelming with callbacks. I decided to use promises to clean up the code. Which worked well but while testing I found that IE didn't support the promises API. To solve this I added in a polyfill and it has been working very well since. I'm very happy with the user experience of the add-in. It is very easy to get started and provide value right away. I believe the users will find this add-in easy and helpful. I learned that the Office API is pretty awesome. It was a pleasure to work with. Especially the well known objects. That made getting phone numbers & emails really easy for read type of appointments. I was pleasantly surprised by that. The add-in store! Here we come. I'd also like to enhance the experience a little further by making use of EWS. These instructions are for Office 365 users. Adjust the URL for your OWA if you are not a subscriber. Click the ** LineOne icon** . This will open up a side pane. Click on Create Account to sign up. Once completed go back to OWA and click the I've created my account. Click on the LineOne icon. Verify the number and pin that we found. Adjust if needed. Click Schedule and you are done.